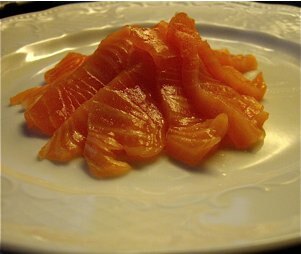 If you are preparing a tartare or a sushi style dish from raw salmon, you will have to freeze it down from hygienic reasons, unless it is a sushi quality piece of fish. As I did some grocery shopping the other day, I found Salma salmon at discount price of less than €30 a kilo at Ultra Bryn. I bought a 400 gram (a little less than one pound) piece, and made two dishes from it, one raw and one fried, both delicious. 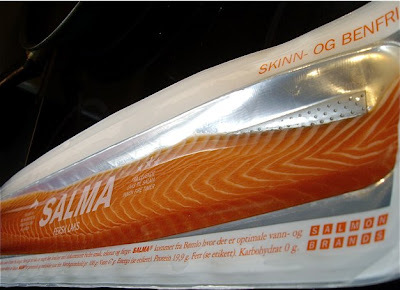 Salma salmon market itself as a superior product with a 4 hour production line from slaughter to vacuuming. It is a bone-free fillet, meaning that you may use it immediately - as I did. Her is what I made. This way of preparing Salma salmon was introduced by the cook that promoted Salma salmon at Ultra Bryn. He had already prepared a tasty salmon tartare (i.e. chopped raw salmon served on toast). The dressing was stunning, and I could not wait to prepare this dish myself. I call this little starter sashimi, as there is much inspiration from this Japanese tradition, even though salmon is the only ingredient in the dish. 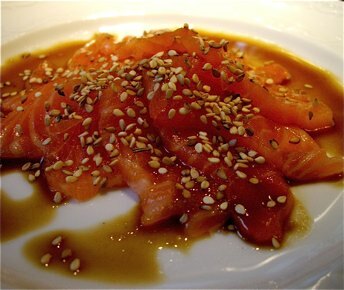 Arrange the finely sliced salmon on two small plates. Mix wasabi, lime juice and soy to match your taste. Pour dressing over salmon. Toast sesame seeds in a hot pan. Sprinkle over salmon and add a few drops of sesame oil to boost that nutty taste. I had around 250 gr or 9 oz left, enough for two servings. I decided to use my favourite seasoning, Tone's Salmon and Seafood seasoning, a blend of onion, garlic, lemon peel, dill and other spice. As this seasoning is available in US only, make your own blend or use your favourite fish spice mix. I covered the surface with my seasoning, and fried the salmon steaks for a minute only on each side. 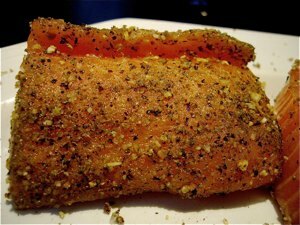 I recommend to fry the salmon too little, rather than too much, as it may end up dry if over cooked. I was lazy, and bought ready made Knorr Hollandaise sauce, tasty, easy to use and with few calories (280 kcal per 100 grams) compared to a serving of a full butter based sauce. I made fried potatoes with garlic and herbs and oven baked asparagus as greens.